I am sure everyone is busy with last minute wrapping and organising for tomorrow’s festivities. However, in a day or two from now we will wonder what all the fuss was about, because ultimately Christmas is all about being close to those that matter, i.e. in person, by card or email etc., not just the top show! So just enjoy your time spent with loved ones – human and animal. I would like to take this opportunity to thank you all for the support and encouragement that you have given me this year, both in my one to one coaching as well as through The Academy with it’s launch. I am really looking forward to all of the exciting times ahead in 2015 where we have some fabulous content to be shared through webinars, Live Q&A’s with some brilliant guest lecturers, the launch of our How Horses Learn Online Course, clinics and workshops in training with positive reinforcement, the mechanical horse, human biomechanics, horse anatomy as well, of course, as working together with you to bring your dreams to life with your horses. 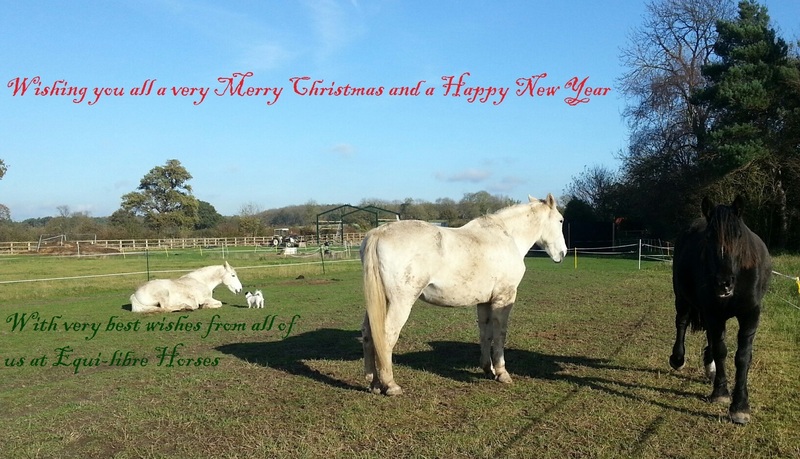 Wishing each and every one of you and your horses a very Happy Christmas and a successful and healthy 2015.